Deb's Cup of Tea: One flower done. 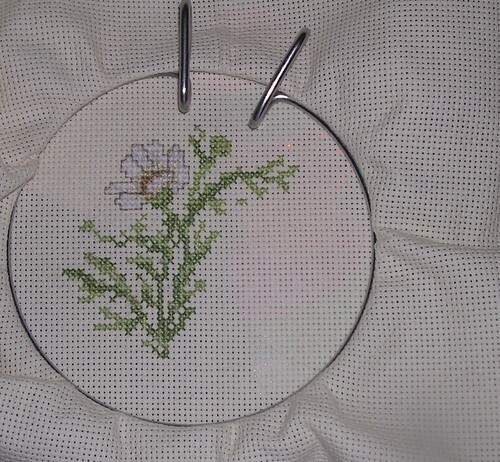 Working at this on Tuesday and Wednesday and I have one daisy done. Of course, I've made muffins, two kinds, while stitching. One of the things I noticed with the light colored thread, it would, occasionally, get very dark, almost black, in color. I looked at the thread. I looked at the hoop. I couldn't figure it out. Then it dawned on me. I have a black, long-haired cat living with me. So, while I pick out as much as I can, I can't get all the hair out. The recipient will need to understand that. Perhaps, they won't even notice. It's just Pilchard's way of saying this is a joint project.